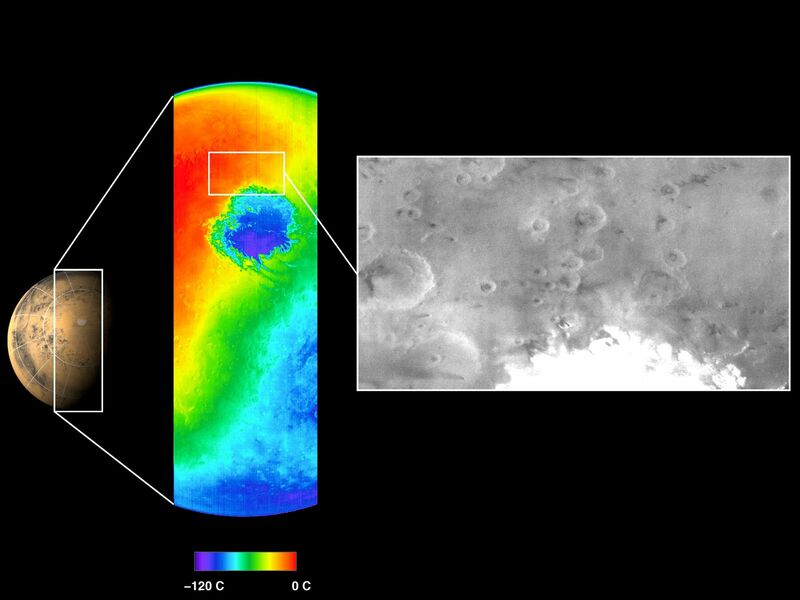 This picture shows both a visible and a thermal infrared image taken by the thermal emission imaging system on NASA's 2001 Mars Odyssey spacecraft on November 2, 2001. 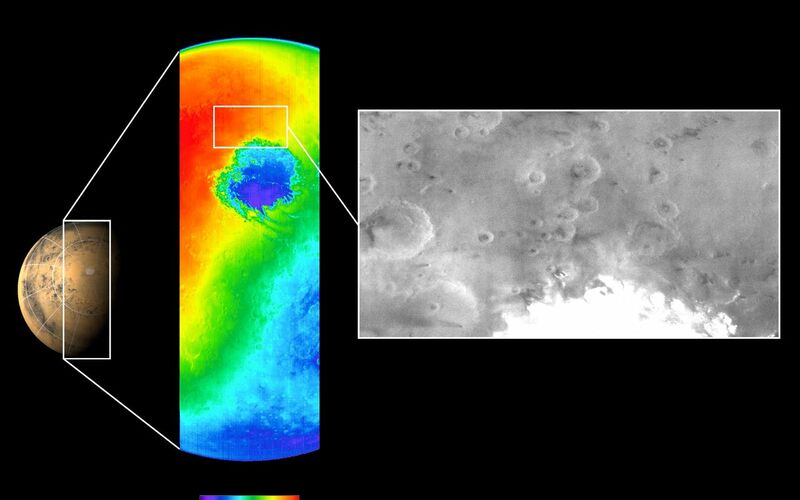 The images were taken as part of the ongoing calibration and testing of the camera system as the spacecraft orbited Mars on its 13threvolution of the planet. The visible wavelength image, shown on the right in black and white, was obtained using one of the instrument's five visible filters. The spacecraft was approximately 22,000 kilometers (about 13,600 miles) above Mars looking down toward the south pole when this image was acquired. It is late spring in the martian southern hemisphere. 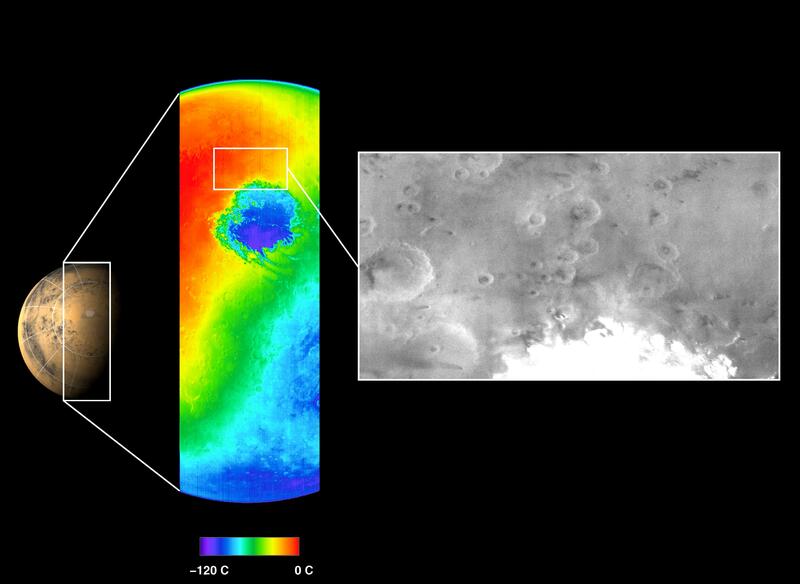 The thermal infrared image, center, shows the temperature of the surface in color. The circular feature seen in blue is the extremely cold martian south polar carbon dioxide ice cap. The instrument has measured a temperature of minus 120 degrees Celsius (minus 184 degrees Fahrenheit) on the south polar ice cap. The polar cap is more than 900 kilometers (540 miles) in diameter at this time. The visible image shows additional details along the edge of the ice cap, as well as atmospheric hazes near the cap. 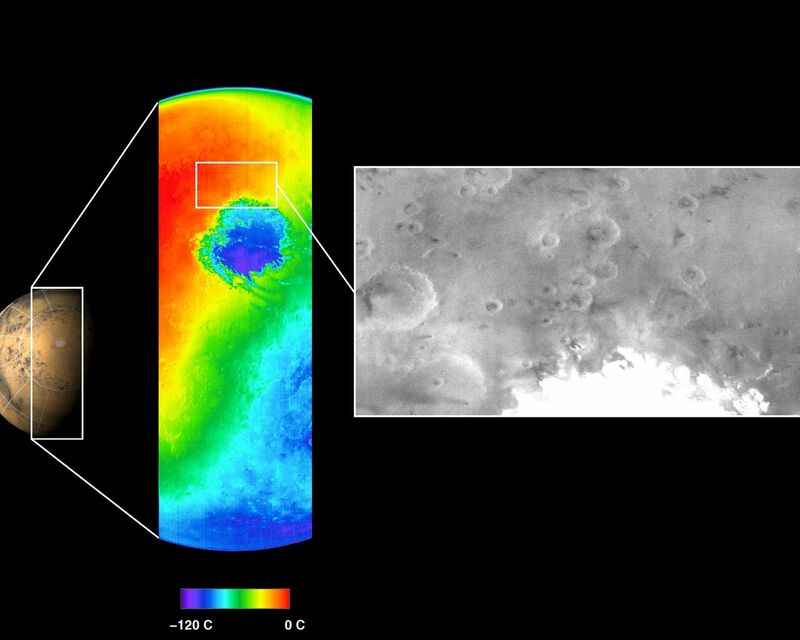 The view of the surface appears hazy due to dust that still remains in the martian atmosphere from the massive martian dust storms that have occurred over the past several months. The infrared image covers a length of over 6,500 kilometers (3,900 miles)spanning the planet from limb to limb, with a resolution of approximately 5.5 kilometers per picture element, or pixel, (3.4 miles per pixel) at the point directly beneath the spacecraft. The visible image has a resolution of approximately 1 kilometer per pixel (.6 miles per pixel) and covers an area roughly the size of the states of Arizona and New Mexico combined. NASA's Jet Propulsion Laboratory, Pasadena, Calif. manages the 2001 Mars Odyssey mission for NASA's Office of Space Science, Washington D.C. The thermal-emission imaging system was developed at Arizona State University,Tempe, with Raytheon Santa Barbara Remote Sensing, Santa Barbara, Calif. Lockheed Martin Astronautics, Denver, is the prime contractor for the project, and developed and built the orbiter. Mission operations are conducted jointly from Lockheed Martin and from JPL, a division of the California Institute of Technology in Pasadena.